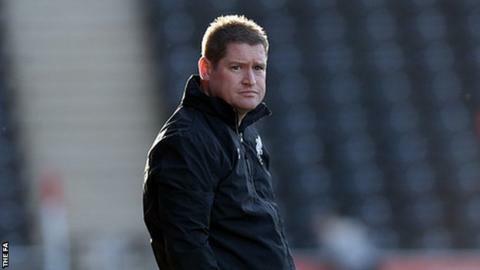 Matt Beard says he expects Arsenal, Chelsea and Manchester City to keep strengthening their squads. Liverpool Ladies manager Matt Beard says Arsenal, Chelsea and Manchester City will dominate the Women's Super League in the coming years. Beard, who is set to join US side Boston Breakers at the end of the season, warned that clubs like Liverpool will soon struggle to compete against clubs with bigger budgets. "I've taken Liverpool as far as I can," he told BBC Sport. "I don't think anyone can contend with Man City, Chelsea and Arsenal." He continued: "They've taken it to a different level with their investment." Beard won back-to-back WSL1 league titles with Liverpool in 2013 and 2014, but has endured a disappointing campaign this year, with his side currently second from bottom with one game to go. The club saw key players such as England duo Lucy Bronze and Gemma Davison leave at the start of the season and also suffered a large number of injuries. Beard admits that while some clubs are stepping up their investment and player recruitment, others are getting left behind. "You've only got to look at the players Chelsea have signed and look at what Arsenal did in the break and I'm sure they'll go again," he said. "I think you're going to have a mini league with those three, with the rest trying to break into the middle and bottom spots, it'll be difficult." Beard's comments came after his side were beaten 4-0 at home by Chelsea in their penultimate match. The result ensured that this season's WSL1 title can now only be won by the West London side or Manchester City, with Arsenal the only other team capable of gaining a European football spot.